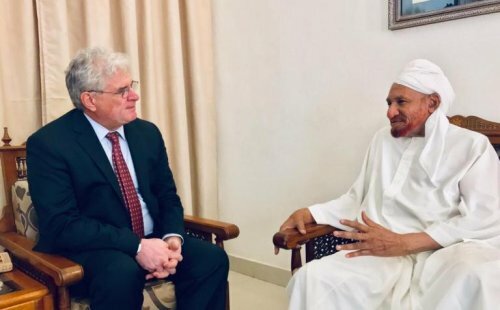 February 11, 2019 (KHARTOUM) – U.S. Chargé d’Affaire Steven Koutsis discussed with the leader of the opposition National Umma Party (NUP) the attack by the Sudanese security agent on a mosque of his religious sect, Al-Ansar, last Friday as the embassy expressed its concern about the recurrent use of violence. On 8 February, Sudanese security forces fired teargas and beat worshippers attempting to stage a peaceful demonstration after Friday prayers at the Al-Sayed Abd al-Rahman al-Mahdi Mosque in Wahd Nubbawi neighbourhood of Omdurman. The attack resulted in injuries to several people. “Chargé d’Affaires Steven Koutsis met with Imam Sadiq Al-Mahdi to discuss the inappropriate attack on the Al-Sayed Abd al-Rahman al-Mahdi Mosque and its worshipers on February 8,” said the U.S. in Khartoum in a statement released by the U.S. Embassy on Monday evening after the meeting. The statement further said that the Embassy is concerned about the use of violence. “We are troubled by the frequent use of force by the Sudanese government’s security forces, including the use of live fire and beatings and the entering of mosques, hospitals, schools, private homes, and other locations that should be recognized places of safety”. Human Rights Watch released verified Video footage on Monday that shows government forces’ extreme violence and shocking abuses against protesters during the seven weeks of peaceful protests across the country. The rights group called on the United Nations Human Rights Council to appoint an investigation committee to investigate the human rights violations against peaceful protesters. Koutsis welcomed the recent efforts by the High Prosecutor General and the National Human Rights Commission to investigate the death of Kassala State teacher Ahmed Al Kheir. However, he called to hold accountable the security official who commit such crimes. “We believe that a transparent, independent investigation that holds responsible officials to account will lead to a change in the government’s treatment of those held in detention,” said the American diplomat. He also called for the release of the detained political opposition members, human rights activists, and peaceful protesters. Jehanne Henry, associate Africa director at Human Rights Watch, pointed out to the existence of credible evidence proving the use of excessive violence against civilians and called to hold accountable those who are responsible for these crimes. “With each passing week the situation is getting worse,” Henry said. “It is high time for the UN Human Rights Council to ramp up monitoring and reporting on the situation and to send investigators to the country at once,” she stressed.